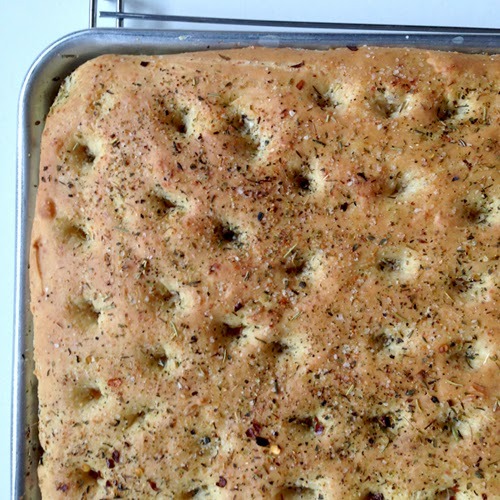 I wrote a post on focaccia a few years ago when I started this blog, but I didn't actually type out the recipe. I just had the link to KingArthurFlour.com. These pictures are a little better, and I also wrote the recipe below exactly as I made it. I suppose you could mix it up and add other things, but this is what I did. 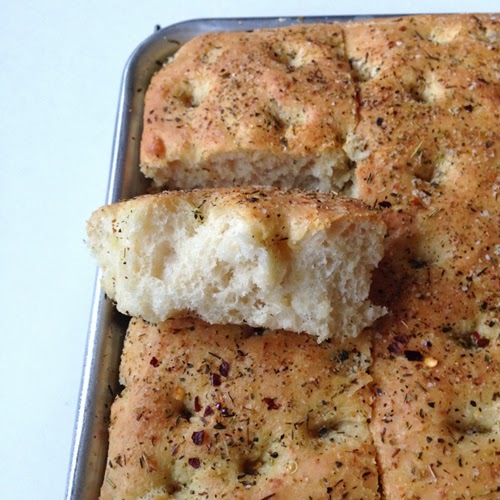 This bread is super easy, and is ready in less than two hours with very little work. Most of that two hours is for rising and baking. The bread is soft and thick, and with all of the garlic salt I put on and in mine, it's pretty salty--not too salty, but fabulously salty. Tonight this was a side dish for my first attempt at homemade meatballs with spaghetti. It also made a very tasty lunch for me today at work. If you're new to the bread-making scene, give this one a try. I think the only way you can mess it up is if your water is too hot. Always better to err on the side of your water being too cool as opposed to too hot. If it hurts your fingers to touch the water, by the way, it's too hot. Anyway, here you go. Try it. You'll like it. In the bowl of a stand mixer fitted with a paddle attachment, put in the water, oil, salt, garlic salt, flour, yeast, and Parmesan cheese. Mix on low until dry ingredients are moistened and then mix on high for about 1 minute. Remove paddle attachment, scraping off as much dough as you can. 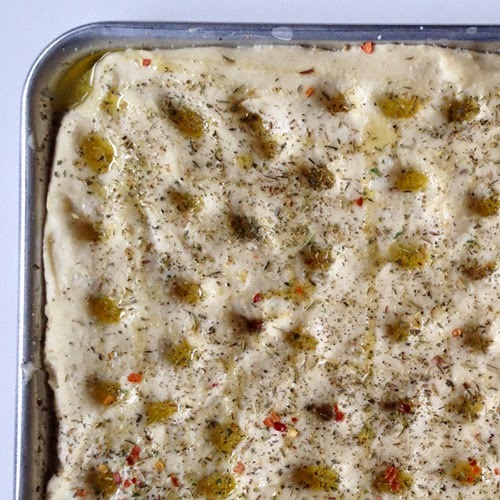 Allow dough to rest while you prepare the pan (makes it easier to spread the dough in the pan). Grease a 9 x 13 inch pan with the 1/2 tablespoon butter and 1 tablespoon vegetable/olive oil. Sprinkle the bottom with a little of the Italian seasoning and garlic salt. Scrape dough into the greased pan, and with greased fingers push and gently pull dough around to evenly spread it into the pan as close to the edges as you can. Set dough to rise at room temperature for 1 hour. When dough has risen, with a greased finger, poke holes all over the top of the dough, about 1 to 1 1/2 inches apart. Drizzle with olive oil and sprinkle with Italian seasoning and a little more garlic salt. Bake at 375 degrees for 25 to 30 minutes, or until a nice deep golden brown color on top.